General Sarge loves to help out at the Recruiting Station and he even enjoys it more when he can help out the fine recruiters at the Newark, New York Station. We’ve become great friends with everyone at the local center and this weekend is Newarkfest time in Newark, New York. Main Street hustles with activity as it closes down to make way for a yearly festival. As soon as General Sarge heard that his friends from the Recruiting Station were going to be there with a booth he just had to make a visit. Here he is standing by one of the really cool Army Hummers with SFC Smith one of the recruiters from the Newark station. 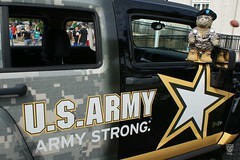 It’s worth pointing out that there are two Army Hummers at Newarkfest. 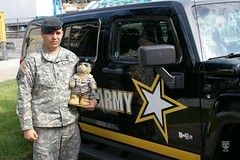 The one in the picture with SFC Smith as well as a bigger one! General Sarge of course had to get a picture snapped with both Hummers. As you can tell this one is bigger than the other one. Then, when we turned our back for a moment General Sarge pulled rank and told one of the recruiters he wanted to take the Hummer for a spin! It’s probably a good thing the keys weren’t in the hummer or General Sarge may have tried to go cruising. I have a feeling his “paw” feet were not reaching the pedals. 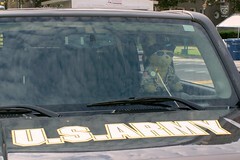 This entry was posted in 2011 General Sarge Posts and tagged Army, Build-A-Bear, General Sarge, Military, New York, Teddy Bear. Bookmark the permalink. Yes indeed all the recruiters stand tall when I show up on the scene. They’re also always very nice to me. If you’d like, and if I can sneak it away, I’ll swing by and we can go cruisin’ in the Hummer. It’s a pretty cool ride. (As for SSG Smith, you are right! Dr. Rus keystroked wrong. We shall fix that rank now). You sure are busy, General Sarge! Keep the updates coming! Thanks for dropping by and thanks for the comment. Yes, there’s never a dull moment around here. Today is another full day as we’re going to a car show today! My human-owner PV2 Ben absolutely loves his Dad’s 1998 Mustang named Stella. There’s a car show today as part of Newarkfest so we’re going to that. We’re even taking some pictures of PV2 Ben with us so everyone can see how proud we are of him.